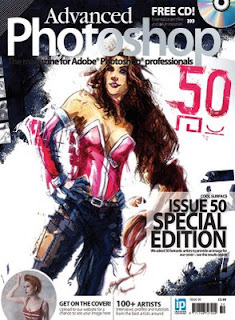 Advanced Photoshop’s 50th issue – 50 covers by 50 artists! You can now pick up the big 50th issue spectacular of Advanced Photoshop, where we took part in their lead feature “50 Covers by 50 Artists”. The jpeg here is a tad small, but if you look carefully you can see we included a film strip featuring our long history with Advanced Photoshop magazine: our winning Peer Pressure appearance (remember that? ), our first ever tutorial, the first ever winning monthly competition image and our most recent tutorial for Advanced Photoshop! You are currently browsing the archives for the distorted pink top category.